How much does a pet cost you during its typical life span? The most expensive pet to own? A cockatoo. If you’ve ever seen the cockatoos at a pet store and thought about keeping these large and magnificent birds- don’t. Yes, they are beautiful, and yes, they are relatively smart. But, they will cost you $1,035 a year after spending $1,535 the first year. And these guys are no guinea pigs. Expect your cockatoo to live for 50 years, costing you a total of $52,250. via How Much Our Pets Cost in a Lifetime – VisualEconomics.com. What kind of pets have people searched so far this year on Iwanna.com? That means a lot of pet-friendly family budgets out there. But not a lot of expensive bird interest. How do Asheville’s real estate problems compare to other markets? Not too bad, according to a mortgage analysis by CoreLogic, a leading provider of real estate reporting and analytics (www.corelogic.com). CoreLogic released a report for 164 metro areas that shows Asheville ranking better than 90% of the rest of the country in “negative equity share.” That means Asheville is far better off than the rest of the country when it comes to home owners who are “underwater” or “upside down” in their mortgages — borrowers who owe more on their mortgages than their homes are worth. The most recent data was better than the first quarter of 2010, but CoreLogic said the reason was because of foreclosures rather than stabilizing or improving housing prices. And where foreclosures are high, housing prices fall. Las Vegas topped the list of metro areas with the highest negative equity report, with 72.8% of its homeowners in negative equity. Comparatively, Asheville has only 6.6% in negative equity — 13th lowest in the country. That bodes well for home values here. The worst states for underwater homes are California, Nevada, Florida and Arizona. But many experts expect housing prices to continue falling through the rest of the year. “Negative equity continues to both drive foreclosures and impede the housing market recovery. With nearly 5 million borrowers currently in severe negative equity, defaults will remain at a high level for an extended period of time,” said Mark Fleming, chief economist with CoreLogic. While the big car news this week is the impending debut of the Chevrolet Volt on the nation’s roads, the electric car won’t be available in the Carolinas until 2011 at the earliest. During Chevrolet’s rollout announcement this week, it suggested anyone could order the Volt and track it through the delivery process. However, a search for dealers selling Volt within 500 miles of Asheville zip codes at www.getmyvolt.com comes up with a big fat zero. While you won’t be able to order a Volt locally for a while, on the upside, you may see a Volt-powered Cadillac in the next two years. Luxury green. Just wait for it, some more. For now, you’ll have to go to one of the seven big rollout markets to get a new Volt. However, if you plan to go to California to buy one and drive it home, stay away from the HOV lanes. In a regulatory mess, all-electric cars apparently can’t use the high-occupancy vehicle lanes on California freeways. The Volt runs at highway speeds on its battery. a Chevrolet Volt that does less than 40 miles a day may never burn a drop of gas, for instance, but will still be banned from the HOV lanes.Whereas the 2012 Toyota Prius Plug-In Hybrid that’s being flogged down the freeway at 85 mph will consistently burn gasoline at its highest rate, and yet it will be able to do so from the HOV lane. via Chevy Volt: No $5K rebate, carpool-lane access for CA buyers | VentureBeat. At a $41,000 price tag, that’s an expensive investment to stay stuck in traffic. You can follow live updates by subscribing to the Volt Twitter feed. …users will have the opportunity to bid on seven of the most coveted electronic consumer items on the market. The auctions will have no reserve price and bidding will start at $1.00. All proceeds from the auctions will go to the winner’s favorite 501c3 charity. “At Boocoo Auctions we are always looking for innovative, fun, and meaningful ways to improve the auction experience,” said George Willard Sr. the CEO of Ranger Data Technologies Inc., parent company of Boocoo Auctions. “We feel it’s important to experiment with new platforms and programs to improve the opportunities for buyers and sellers. The “two hour auction” is another example of that type of innovation,” said Willard. Boocoo.com launched June 21st, with Iwanna as one of nearly 300 media partners. In the first three weeks following the launch, the site has already achieved nearly 6,000 registered users. “With our large number of media partners, we will continue to test new ideas across a wide section of demographic and geographic territory,” said Willard. 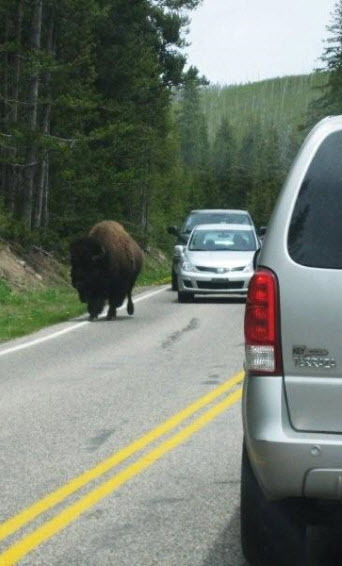 Picture taken from the car of an Asheville resident visiting Yellowstone this week. What are you doing this weekend? Don’t forget to submit your photos to our Summer Fun Photo Contest, which could earn you $1,000 by the end of the summer!